PeaceBang's Beauty Tips For Ministers: Because you're in the public eye, and God knows you need to look good. See you over at WordPress, and adieu to Blogger! Most of the archives have been moved, so comments will be closed here. "The Association of Theological Schools in the United States and Canada (ATS) and the Henry Luce Foundation have named Amy M. Hollywood, the Elizabeth H. Monrad Professor of Christian Studies at HDS, as one of seven Henry Luce III Fellows in Theology for 2007–08. will juxtapose medieval Christian mystical texts in which union with Christ is understood as a form of melancholic lovesickness with modern theological, psychoanalytic, feminist, and queer accounts of mourning and melancholia." Go, Amy Hollywood, go, go!! Please publish that book as soon as you can, and know that PeaceBang is salivating in anticipation as she simultaneously shyly admires the heck out of your glamorous name and beautiful self. And to the HDS person who thought my little accomplishments here worthy for inclusion in the lastest alumn/ae news, I tip my hat in surprised appreciation. One does what one can, my Crimson friends, one does what one can. I've been feeling so drab lately, and when I looked in the mirror on Tuesday night after a long day, I noticed that my face looked actually dirty. Suspicious, I paid special attention to my make-up the next morning. I had just purchased Bare Minerals and as I applied it, I realized that it was two to three shades too dark. Also startlingly yellow against my pink skin. The gal at Sephora whence I purchased it a few weeks ago didn't think it necessary to "color test" me-- too expert at assigning the right shade of Bare Minerals foundation to various women's skin was she. She took one look at me and pronounced me Medium Beige. It was a thrilling moment. My brain fell right out the hem of my pants. "Gee, I can't believe it! I'm so fair!" I said. Dear readers --consider PeaceBang Exhibit A in the case against the cosmetics industry-- which can so easily dupe us into thinking that we don't know nuthin' about our own body. Can you believe that I sort of thought that I had GRADUATED from the super fair shades into a more adult, substantial skin tone? Like, well, I'm over 40 now, and I guess I'm no longer ivory, but MEDIUM BEIGE. That girl should know. She has a white lab coat on. Oh, vanity, vanity, all is vanity saith the preacher. So this dumb bunny went back to Sephora yesterday and got color tested, and it turns out that the true match was with the shade "Light," and today I feel bright and polished and not muzzy-faced and dirty, and you know, PeaceBang has learned her lesson. The next time some cosmetics wench tries to convince her that a hideously unflattering color is HER, she will respond, "Thank you for thinking so, dearie, but I'm the one who's been living with this face for over 40 years, and I can tell you that that I will look like a mud turtle in that particular shade." P.S. I bought a deliciously pink-coral lipgloss by Smashbox in the color "Blur." And I know I'm disgustingly shallow for the happiness it is bringing me this morning. Will you begrudge that to PeaceBang, who has a 20-page paper due next week, and an annual report? Of course you won't. And that's why I love you. 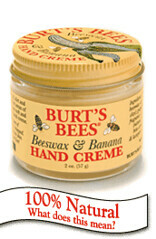 A caring chaplain wrote in to share her penchant for Burt's Bees hand cream. hospital chaplains with dried out abused hands that have been prayin' all day and getting washed between all patients with super-foam that kills everything, including your nice hands. The chaplain can go home at night, glob salve generously on her hands, and put her abused fingers into those funny white cotton gloves for some TLC. It doesn't make it perfect, but it at least keeps your hands from peeling apart in many pieces (as mine were doing near the beginning)." PeaceBang would like to add that cracked hands are more easily-infected hands, and working in a hospital puts enough stress on one's immune system. So take care of your lovin' hands, not just for vanity's sake, but for your comfort and health as well. Hey guys, this goes for you, too. Burt's Bees products seem to be available just about everywhere these days. They have a wide variety of hand salves and I'm sure you'll find one that suits you. PeaceBang has also heard good things about Eucerin (the kind in a tub), but thinks that product is probably petroleum-based. Did you know that good old olive oil also makes a perfectly terrific moisturizer for the hands? Especially with the cotton gloves overnight. Tra La, It's May! We Have a New Website Coming! Remember when Queen Guenivere went scampering about with all her knights and ladies singing, "It's May! It's May! The lusty month of May!" Well, that's because Gwenny wasn't in the parish ministry, and she looked all dewy and fetching in her slightly undone braids and strangely anachronistic Empire-waist chiffon gown (weren't they wearing, like tapestries back in the Arthurian days?). You and I, however, have every right to look a big draggy right now, with puffy post-Easter eyes and end-of-semester flat hair that could definitely use a dye job. PeaceBang always feels that she's been beaten with the Ugly Stick during these transitional seasons, and you may too, but don't be mean to yourselves, dearies. Put some daffodils on your desk, put on your favorite shoes, and keep on dancin'. And while you're at it, could you please recommend a lipstick shade for a pink-complected redhead who finds that her eternal favorite color just doesn't look good anymore? Speaking of transitions, BeautyTipsForMinisters is moving from Blogger to WordPress!! Please bear with my light posting as I start moving in to the new site, courtesy of the marvelous Scott Wells, BoyIntheBands and Keeper of My Techo-Sanity at this time. A query -I'm trying to replace my Clinique make-up products (expensive, and I usually can't resist shopping at Macy's afterwards, so more expensive). I'm loving my Cover Girl mascara and eye liner, Almay eyebrow pencil (with a tiny point that you twist out instead of sharpen, so less wasteful) and Revlon long-lasting lipstick in Bare Maximum. But so far, I haven't found any type of concealer that I like nearly as well as the Clinique. I like a liquid/wand more than crayon types - less scraping against the delicate under-eye. Any suggestions? Gidge, darling, I'm sure my readers will have a plethora of fantabulous suggestions for this very important question. All wand-applied cover-ups cake up under my wrinkly eyes when I smile, so I avoid them, patting on a light, creamy foundation instead and lightly dusting with highlighting powder. Readers, if you have dark shadows around your eyes -- something that is very typical with age and with olive skin tones -- remember that it's a great idea to apply cover-up all over the eyelid. Blend, blend, blend and make sure you don't miss the inner corner by the nose. Real Simple magazine has a very handy-dandy guide to the best drugstore (read: affordable products) buys here. It's arranged by category of product and looks to have excellent suggestions. This is Real Simple's helpful guide to how to buy wardrobe essentials. Actually, as a former subscriber to Real Simple magazine, I must say that I'm very impressed with their web site. I'll be reading more articles when I get a chance. Thanks to SisterBang for the referral! Someone just wrote to me about Lip Ink. I've never heard of it, and I'm fascinated. She's going to send me more info, but have any of you tried it? Comments? It looks like it's organic, and it looks like the starter kit is quite expensive (but that after that, re-fills are quite economical). The blonde model in the video is a little bit overwhelmed by her big red lips, but the other models are wearing more subtle colors that look lovely. Do you have to scrub it off with another special product at the end of the day? I wonder if I could get the company to send me a free starter kit for reviewing purposes...! Religion, ruminations, reflections and ravings of a non-stop ministerial mind. PeaceBang In The Boston Globe! PeaceBang On Busted Halo NOW!